A simple garden this year due to time constraints. Cilantro needs its own space in the garden where you can harvest it and then let it go to seed. It grows fast in the cool weather of spring and fall, creating a rosette of lacy leaves. 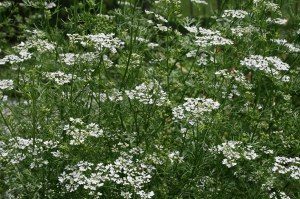 When the weather gets warm, the plant sends up a long, lanky flower stalk bearing flat umbels of white or pinkish blossoms which later produce coriander seeds. Plant cilantro in a bed devoted to herbs where it can reseed, or in a corner of the vegetable garden. In mild climates, cilantro makes a handsome winter companion to pansies. Leaves withstand a light frost. It is best to dedicate a patch of garden to cilantro since it self-sows. Seeds germinate in about 7 to 10 days. Cilantro is best grown by directly sowing seed in the garden for two reasons. It grows so quickly it needs no head start indoors, and since cilantro develops a taproot, it doesn’t like being transplanted. Grow cilantro in full sun and well-drained soil with a pH of 6.2 to 6.8; it will tolerate light shade in the South and Southwest where the sun is intense. In the South and Southwest, plant 12 to 18 inches apart in the fall or the spring about a month before the last frost. Fall is the ideal time to plant in zones 8, 9, and 10 because the plants will last through until the weather heats up in late spring. When plants begin to bloom, the foliage becomes scarce; for steady harvest, set out plants every 3 to 4 weeks until the weather gets warm in spring, or until the first frost of fall. Cilantro is productive for only about 6 weeks in cooler climes, so here are some tips on dealing with cilantro’s persnickety nature. • Dedicate a small patch of garden to cilantro. • Direct sow plants every 2 to 3 weeks, starting about 2 weeks before the last frost date (around May 15). • Retain the patch so self-sown plants will come up in the spring. Application of compost around the base of the plant adds nutrients, helps retain water, and keeps the roots cool. Cilantro frequently self sows. As seeds fall to the ground, little plants often come up during the season and the following spring. Prepare soil by adding some compost or other organic matter to the planting area and working it into the soil to a depth of at least 18 inches. Rake the area smooth. Sow cilantro seeds 1/4-inch deep directly in the garden in late spring or early summer. Sow seeds or thin to 6 to 8 inches apart in rows spaced about 1 foot apart. Provide plenty of moisture and feed cilantro plants with a water-soluble fertilizer when they reach about 2 inches in height. Since cilantro grows so quickly, it can also be sown again in the fall in warmer zones. For a steady supply of fresh leaves all summer, make successive sowings of cilantro seed every 2 to 3 weeks beginning in the spring. Harvest cilantro by cutting the leafy stems near ground level. Cut only about one-third of the plant at a time. The leaves can be cut at any time. Use the upper, new, finely cut leaves in cooking, but not the mature, lower ferny-type leaves. Cilantro is not normally saved and dried like other culinary herbs since, as stated, it loses almost its entire flavor when dried. 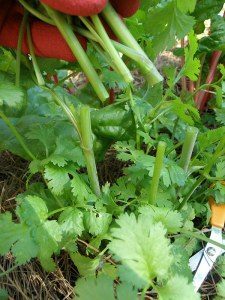 Harvest cilantro by cutting the leafy stems near ground level. Cut only about one-third of the plant at a time. The large coriander seeds are easy to harvest and handle. Harvest on a dry day. Cut the top of the stems when the seedpods begin to turn brown and crack if pressed. Make sure pods are harvested before they release seeds into the garden. Once stems are cut, place seedpods in a paper bag so seeds will be caught. Finish the ripening process for a few weeks in a dark, well-ventilated, cool place. Pods can be shaken or rolled around in your hands to release the seeds. Harvest the seeds by clipping the brown, round seed heads; place upside down in a paper bag. In a few days, the round husks will dry and split in two, dropping the edible seed inside. Don’t delay seed harvest, or the weak stems will fall over. If you’re growing the plant for seed, don’t bother fertilizing since that may delay flowering and thus seed production. Cilantro will grow tall and wispy as it starts to bloom. The white flowers later produce the seeds we all know as coriander. You can harvest cilantro’s foliage continually in the cooler months of spring and fall and through winter in areas without hard freezes. Harvest by cutting the leafy stems near ground level; most will be around 6 to 12 inches long. Avoid cutting more than one-third of the leaves at one time, or you may weaken the plant. Fertilize with Herb & Vegetable Plant Food or fish emulsion after 4 or 5 harvests. it will start to yellow if it is not fertilized regularly. Keeping it fertilized means more leaves for us to harvest….more salsa at my house. Cilantro leaves may also fade from that dark green color when it is grown in soggy soils. Growing cilantro adds a lot of healthy, fresh flavor to your kitchen. Freshly chopped cilantro is an excellent source of potassium, is low in calories, and is good for the digestive system. It is best to use fresh cilantro in cooking since it loses its flavor when dried. Add chopped leaves at the last minute for maximum flavor. Cilantro blends well with mint, cumin, chives, garlic, and marjoram. Store by freezing the leaves in cubes of water or oil; you can dry them, too, but they lose a lot of their flavor this way, which explains why growing your own is far better than buying it from the spice rack. My cilantro is tall and lanky with few leaves. It sounds like your cilantro has started to bloom. Once the weather begins to get warm in late spring or early summer, cilantro will transition from a round, leafy plant with parsley-like foliage into a taller, lacy-leaved plant with white flowers in clusters at the top. In a few weeks, you’ll see round seeds forming. When harvested, these can be ground into coriander. If you leave them to mature, plants will fall to the ground and sprout again in the fall or early spring. While your plant will die after flowering, its offspring will take over, giving you a seasonal supply of flavorful foliage. Without adequate lighting though, expect the cilantro to grow ‘leggy’ or spindly. Compost is a wonderful soil amendment and very easy to make. Containers need to have plenty of ventilation and some moisture. Nothing. Compost can be created by making a 6x6x5 foot pile of alternating brown and greed debris. Chicken wire in a cylinder. Mount 2 stakes in the ground and wrap chicken wire around it. Remove the chicken wire, turn the compost, put the compost back in chicken wire receptacle. The cylinder should be about 3 feet in diameter and 3 to 4 feet tall. A homemade container can be made by taking a small garbage can and perforating it with 1/4 inch holes on the sides and bottom. A closed container has the advantage of keeping critters out better and hiding the contents from the neighbors. Compost tumblers have an advantage of being easy to turn the compost material. They do not hold as much as a garbage can. Construct a pile 4 to 6 feet tall. Start off with a 6 inch layer of brown material followed by 3 inches of green material. One layer is (green) plant debris, which adds nitrogen. Chop or grind large materials into small pieces. Run over stuff with a lawnmower. Use a leaf sucker that chops up leaves. Keep compost moist but not soggy nor dry. Add a thin layer of soil every once in a while. Turn the compost pile every week or so. This reduces odors and helps compost decompose evenly. Compost should be ready in 1 to 3 months. Before using compost, sift it through a 1 inch mesh screen, like chicken wire. Chop up the pieces left over. In order to get the composting kickstarted, your pile needs to be hot and wet. The two biggest problems a compost system encounters are lack of heat and lack of moisture. These affect the composting process in different ways. Try to keep the internal heat of your compost bin at 110 °F (43 °C) or higher. Between 110 °F (43 °C) and 140 °F (60 °C) is the ideal temperature for your pile. If your pile dips below 110 °F (43 °C), consider adding more green nitrogen-rich material or more water. Use a lawnmower or leaf picker-upper to chop leaves into a fine mulch. The mulch can be left on the ground or added to the compost pile. 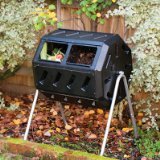 Keep the composter in a sunny area to speed up decomposition and keep out ants. Bury kitchen scraps under at least 10 inches of compost in the bin so the smell does not attract animals or flies. If there are a lot of ants, that is a sign the compost is not being turned enough. Build three containers: one for composting, one for soil to add to compost, one for starting compost. Sun Drops (hybrid, creamy yellow, unique oval shape, may be harvested as baby with blossoms attached). Plant anytime after the danger of frost has passed, from early spring until midsummer. Some gardeners have two main plantings – one for early summer harvest and another for late summer and fall harvest. Direct-seeding is the preferred method for starting squash. Use a soil thermometer and sow seeds after the last frost date, once soil has warmed to 70° F at the 2-inch depth. Soak the zucchini seeds that you are going to plant in some clean, warm water for eight hours. Sow two or three seeds 24 to 36 inches apart for single-plant production, or four or five seeds in hills 48 inches apart. Cover one inch deep then water. I like to water the seeds for the next three days, unless there is rain. When the plants are 2 to 3 inches tall, thin to one vigorous plant or no more than two or three plants per hill. Zucchini seeds can be planted in a large container with more than one seed. Or you can use individual, smaller containers. The container is filled with your homemade dirt or you can purchase some potting soil at the garden center of your local home improvement store. The seeds need to be placed about an inch from the top of the soil and covered. Water the soil generously the first day and then every few days after. The container should have holes in the bottom and be set in a water catch. Zucchini likes well-drained soil, but it will tolerate a damp soil especially when it is young. The plants also like a lot of sun, so make sure to set them in a sunny window or an enclosed porch. After your plants have germinated and you have some leaves beginning, you can plant it outdoors, weather permitting. If the plants are in a large enough container, they can actually stay in these and grow to full size. They should be fully grown and ready to pick in 45 to 50 days. You can leave them longer and grow larger zucchini but they are tougher and not as tasty. Any well-drained garden soil produces excellent yields of summer squash. Certain mulches increase earliness and yields, because the roots are shallow. Keep mulch 1 to 2 inches from plant base. Use 2 inches of fine mulch. Because summer squash develop very rapidly after pollination, they are often picked when they are too large and overmature. They should be harvested when small and tender for best quality. Most elongated varieties are picked when they are 2 inches or less in diameter and 6 to 8 inches long. Patty Pan types are harvested when they are 3 to 4 inches in diameter. Slightly larger fruit may be salvaged by hollowing out and using them for stuffing. These larger fruits may also be grated for baking in breads and other items. Do not allow summer squash to become large, hard and seedy because they sap strength from the plant that could better be used to produce more young fruit. Pick oversized squash with developed seeds and hard skin and throw them away. Go over the plants every 1 or 2 days. Squash grow rapidly; especially in hot weather and are usually ready to pick within 4 to 8 days after flowering. Cucumber beetles attack seedlings, vines and both immature and mature fruits. They can be controlled with a suggested insecticide applied weekly either as a spray or dust. Be alert for an infestation of cucumber beetles in early September because these beetles can damage the mature fruits. Squash bugs attack vines as the fruit begin to set and increase in numbers through the late summer, when they can be quite damaging to maturing fruit. They hatch and travel in groups, which seem to travel in herds until they reach maturity. Using the proper insecticide when the numbers of this pest are still small minimizes damage. The eggs congregate under the leaves in neat rows, usually starting in June. All squash plants are monoecious, which means there are separate male and female flowers on the same plant. A less common reason for zucchini fruit falling off a plant is blossom end rot. The tell tale signs of this are blacked ends on the stunted fruit. Blossom end rot is caused by lack of calcium in the soil. 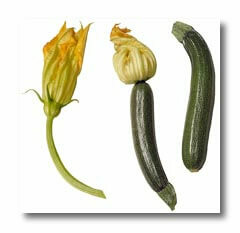 Unlike other common vegetables such as beans and peas, zucchini produces both male and female blossoms. Because the male blossoms appear first to attract bees, your zucchini plants may produce blooms for a week or more that do not set fruit. The male bloom contains the pollen necessary to pollinate the female blooms, but does not produce fruit on its own. Male blooms appear on a long slender stem. To ensure there is always plenty of pollen available, the plants produce many more male flowers than females. Female blooms appear several days to a week or more after the male blooms. These blooms contain a swollen ovary at the base of the bloom that looks like a miniature zucchini. These blooms must be pollinated before the young fruit can grow. Bees visit the male bloom where pollen sticks to their bodies. When they visit the female blooms, the sticky anthem inside the blossom attracts the pollen. When the pollen is deposited in the female bloom, the young fruit swells and begins to grow. If the female bloom is not pollinated, the flower shrivels and the tiny fruit drops from the vine. Sometimes, a lack of pollination occurs and the zucchini plant fails to produce fruit. This can occur for several reasons. Lack of bees due to environmental factors such as the use of pesticides that has killed beneficial insects, prolonged rainy weather, which reduces bee activity, or high temperatures which also inhibit bee activity and cause pollen to degrade. All contribute to lack of pollination. Humid and rainy weather causes pollen to clump. Hand pollinating your zucchini plants may be your only solution other than adding a beehive to your garden. Using a wet paintbrush to collect pollen from the male blooms and depositing it into the female bloom works well and typically solves the issue. Zucchini flowers tend to open up wide in the morning and are often closed by the afternoon so it is important to hand pollinate in the morning. Q. Will summer squash cross with winter squash? A. Summer squash varieties can cross with one another, with acorn squash and with jack-o’-lantern pumpkins. Cross-pollination is not evident in the current crop, but the seed should not be sown for the following year. Summer squash does not cross with melons or cucumbers. Most people harvest summer squash too late. Like winter squash, summer squash is an edible gourd. Unlike winter squash, it is harvested at the immature stage. Ideally, summer squash should be harvested at 6 to 8 inches in length. Pattypan and scallopini are ready when they measure about 3 to 4 inches in diameter or less. Tiny baby squash are delicious too. Large rock-hard squashes serve a better purpose on the compost heap than in the kitchen. Cut the squash from the vine using a sharp knife or pruning shears to avoid damaging the plant. Summer squash vines are very prolific, the more harvest the greater the yield. The most important characteristic to remember is that summer squash is best when immature, young and tender. In this section, summer squash varieties will be limited to zucchini, yellow squash (crooked and straight), pattypan which is also call scalloped and scallopini. Because summer squash is immature, the skin is very thin and susceptible to damage. Handle with care. The average family only needs to plant one or two of each variety. Over planting usually leads to hoards of huge inedible fruit and/or scouring the neighborhood for people to take the surplus. To store summer squash, harvest small squash and place, unwashed in plastic bags in the crisper drawer of the refrigerator. Wash the squash just before preparation. As with most vegetables, water droplets promote decay during storage. The storage life of summer squash is brief, so use within two to three days. Squash blossoms are edible flowers, raw or cooked. Both summer and winter squash blossoms can be battered and fried in a little oil for a wonderful taste sensation. Harvest only the male blossoms unless the goal is to reduce production. Male blossoms are easily distinguished from the female blossoms. The stem of the male blossom is thin and trim. The stem of the female blossom is very thick. At the base of the female flower below the petals is a small bulge, which is the developing squash. Always leave a few male blossoms on the vine for pollination purposes. There are always many more male flowers than female. Harvest only the male squash blossoms unless you are trying to reduce production. The female blossom can be harvested with a tiny squash growing at the end and used in recipes along with full blossoms. Use the blossom of any variety of summer or winter squash in your favorite squash blossom recipe. Use pruning shears or a sharp knife to cut squash blossoms at midday when the petals are open, leaving one inch of stem. Gently rinse in a pan of cool water and store in ice water in the refrigerator until ready to use. The flowers can be stored for a few hours or up to 1 or 2 days. If you’ve never eaten squash blossoms, you are in for a treat. A recipe for Stuffed Squash Blossoms is in the recipe portion of this section. Because summer squash is immature, they are considerably lower in nutritional value than their winter counterparts. Generally, there is little variation in nutritional value between varieties. The peel is where many of the nutrients hide, so never peel summer squash. Summer squash can be grilled, steamed, boiled, sauteed, fried or used in stir fry recipes. They mix well with onions, tomatoes and okra in vegetable medleys. Summer squash can be used interchangeably in most recipes. Tinybaby squash can be used as appetizers, or left whole and sauteed with other vegetables. Don’t waste male squash blossoms by leaving them in the garden. If you do not have the time or inclination to prepare them separately, toss them in the salad bowl or add to any squash preparation. Cooking summer squash seeds, like pumpkin seeds, are delicious. Canning is not recommended because the tender summer squash will simply turn to mush during processing, unless you are making pickles. Zucchini can be substituted for cucumbers in some pickle recipes. The results are especially good in your favorite recipes for Bread and Butter Pickles. Blanch and freeze cubes or slices of summer squash or grate and freeze Zucchini, unblanched for making Zucchini bread. The best way to use over grown (10 to 12 inches) zucchini is to grate it and use in zucchini bread. Cut the squash in half lengthwise and cut away the seedy middle section. Wash, grate and freeze in one cup portions. Use zip closure freezer bags or rigid freezer containers leaving 1/2 inch head space. Over size zucchini can also be used to make canned zucchini chutney. The over 12-inch monsters should go on the compost heap. Also spelled Camomile, this herb is a native of Europe, and was brought by early settlers to North America. Two main types of chamomile exist: German Chamomile and Roman Chamomile. The first is an annual that grows to about 2-3 feet, while the second is a perennial that grows to be about 4-12 inches. Both varieties of chamomile reseed themselves, so you don’t need to plant too often. Water on a regular schedule, taking care to not overwater. Aphids, mealybug. Minimal disease issues. Chamomile may be considered a noxious weed or invasive plant in some areas. Chamomile is known to attract bees, butterflies or birds and has fragrant blossoms. Chamomile self-sows freely; remove flowers (deadhead) if you do not want volunteer seedlings the following season. Outdoors, containers, landscaping, mass plantings. German chamomile not recommended for containers. Chamomile grows to a height of 20 to 30 inches (50 – 70cm). Chamomile plants should be spaced 6 inches (15 cm) apart. Chamomile will grow in a relatively wide pH range between 5.6 (acidic) and 7.5 (neutral). From seed. Direct sow in spring or fall. Fall sown seeds germinate following spring. Seeds need light to germinate. Well drained, poor to average soil. Soilless potting mixes, perlite, vermiculite, rockwool, coco peat, Oasis foam. Seeds to finished plugs, 6 weeks; plugs to saleable plants, 6 to 6 weeks. Chamomile grown outdoors prefers full sun but will tolerate some shade. Buy healthy, green plants with no signs of wilting or disease. Plants should be stocky with plenty of leaves. It’s actually a plus if they don’t have any flowers – they’ll divert their early energy into root development rather than flowering. It also needs light to germinate. Scatter the seed on top of the potting soil and press down. Choose a site in full sun with average to rich, well-drained soil. Plant seedlings in spring or mid fall, spacing them 6 inches apart for a carpetlike ground cover effect, or 18 inches apart in herb and flower gardens. Keep soil evenly moist. Mulching is a good idea. Trim faded flowers or shear the plant occasionally to promote new blooms. Fertilize every four to six weeks, or work in a slow-release fertilizer at planting time. Tear out faded annual types of chamomile at the end of the season, once frost fells them. Cut back perennial types to just 2 or 3 inches. Chamomile comes in both annual (grows just once a year) and perennial (returns year after year) types. German chamomile (Matricaria recutita) is the annual type; Roman chamomile (Anthemis nobilis) is the perennial type. Growing just 3 to 9 inches high, chamomile spreads about 24 inches, making it useful as a ground cover as well. It covers itself from early to mid summer in pretty yellow and white flowers, which can be made into chamomile tea – reputed to soothe upset stomachs and digestive systems as well as calm the nerves. Chamomile also likes its soil moist but not wet and does well between pavers and stepping-stones. Chamomile performs well where temperatures in summer do not regularly reach 100 degrees F.
I have German chamomile and beware. It grows and spreads like a weed. The seeds even spread into your lawn and start growing. Still a gorgeous herb. Chamomile tea has a subtle herbal taste and is famously used as a sleep aid and to calm upset stomachs. Two types of chamomile are commonly planted in herb gardens: German chamomile (Matricaria recutita), a robust annual that grows to about 2 feet tall and Roman chamomile (Chamaemelum nobile), a petite perennial. When growing chamomile for tea, use German Chamomile which produces an abundance of apple scented, daisy-like flowers. Here is how to prepare it. Plan on harvesting chamomile in the morning sunlight after all the dew is gone. The plant should be completely dry! The flower part, petals and all, is what you are after. Flowers tend to open up in the morning and will close up when the sun begins to go down. Shake the plant gently to remove any pests or debris. (1) Pinch the flowers off at the stem or cut with gardening shears just below the flower head. Pinching the flowers will allow regrowth of the plant pretty quickly. Use this method if you want a continual harvest. Cutting only the flowers will require using a drying screen. (2) Cut the stems with the flowers attached about 2-3 inches down the stem. Cutting the stems will take longer for the plant to rejuvenate, but you will be able to dry the chamomile by hanging it up in bunches with twine. Either way, once you have the harvest, find a very warm area in your house or garage. Closets make a good choice. Make sure there is no moisture present and keep the chamomile out of sunlight. Any herb will turn moldy if these conditions are present. Dry, dark and hot is what you want. Check on the drying process frequently. Once dried, if you chose to dry the herb by hanging it by the stem, now is the time to remove the flower only. Toss the stem. Place the chamomile in airtight dry glass containers and keep out of sunlight. It is best not to break apart the flower head until you are ready to use it. Keep as much of it intact as possible. Planted Yukon gold (y) and red Pontiac (p) potatoes Apr 11.